What is the filth factor in your home? Explore this list of 13 Filthy Things In The Home to learn if changes are needed. A Free printable for your workplace is included at the end of this post. We all get busy sometimes and don’t have time to get everything done in the house. The laundry may get behind or dirty dishes may sit in the sink overnight but this list of 13 filthy things in the home are things we saw during our 18 years of owning a cleaning business. Live and learn. Many years ago, one of our customers who lived in a rather large home, moved out of the master suite which she shared with her husband. She simply moved into the guest suite on the other end of their home. We continued to clean as if nothing had changed. Obviously they were working on some marital issue which is none of our business. Marriages are all worth saving so I’m glad they worked it out. Nonetheless, as we were cleaning one day, she stepped into the master suite and stated to us that her husband’s filth factor was much larger than her own. It was an awkward apology for her husbands high tolerance to filth. The highest filth factor I would assign became an F9 after cleaning an apartment with that number one day. The resident had opened the cabinet door under the bathroom sink and used that area as a litter box for her 12 cats! No she did not have a real litter box, she just tossed the litter right onto the wood. The owner had to replace the cabinet. This is not a complete list of the filthiest things we have ever encountered but these do rank right up there near the top. Mold growing on the gaskets of the dishwasher and refrigerator! 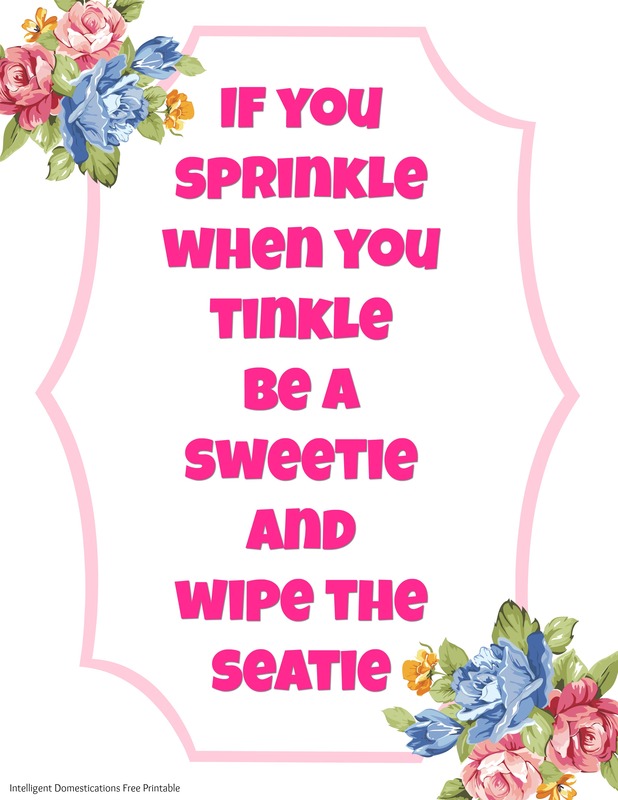 Nasty toilet seats, rims and/or bowls (If you sprinkle when you tinkle, please be sweet and wipe the seat, Free Printable on this page) If you have a blow-out, clean that up immediately. You are wrong for thinking that the cleaning lady see’s that all the time! She doesn’t and your family should be more valuable to you than that as well. Don’t expect any of them to clean that up. Any evidence of rodents or bugs. Yes, they are going to come inside of even the most spotless clean home. Spray for bugs immediately and get rid of them! Nasty cat litter creates multiple problems. It stays between the cats paws and is tracked all over the house. Litter boxes should be scooped daily. Don’t you flush every time? Not wiping down the stove and counters after preparing a meal(s). Just think of the many things which are lain directly onto the surfaces in the kitchen. Germs are transferred by the hands which touch those surfaces and the things which were on them. Caked up food debris is difficult to remove. Not wiping the explosions out of the microwave and therefore allowing it to bake on. To loosen baked on crud, microwave a cup of water for 1 or 2 minutes prior to wiping the microwave. The steam will loosen the debris. Not cleaning the soap scum out of the shower/tub and walls (we have actually had to use a razor blade to scrap out the soap scum in some homes)The longer you let it go, the harder it will be to clean. Nasty sink stoppers, especially in the kitchen. You can put your kitchen sink stopper in the dishwasher on the top rack! Dirty dish clothes! Wash dishes one time only with each dishcloth, then replace it with a clean one for the next time. NEVER use a sponge for dishwashing! Find a free printable with this song at the end of this post. Contrary to popular belief, the ladies room needs this sign also! Do clean the sink prior to making dish water. You can’t clean dishes in a dirty sink. Do scrap/rinse all food debris from dishes, pots and pans prior to putting them into the dish water. Wash the dirtiest pans and cookware last. Greasy water does not clean dishes. If all the soap suds have diminished, drain the dirty water and make clean soapy water. Do not use sponges for cleaning in the kitchen. If you insist on using a sponge for cleaning the kitchen, rinse it thoroughly and soak it in bleach water after each use. 1. Wash them last because you can’t clean dishes with dirty water and this will indeed make the water dirty. 2. If you put your nice clean dishcloth directly onto that surface to wash it, your dish cloth will be permanently stained. Use one of these handy dandy scrubbers for those tough jobs like pots and pans. You can rinse it out good and put it on the top rack of the dishwasher for a good cleaning! Grab this Free Printable for your workplace. Isn’t it funny how one person’s filth factor can be so different from another’s? I heard somewhere once that the kitchen sink is the filthiest place in the house, even dirtier than the toilet! Needless to say, I am fanatical about cleaning my sink!! Um ew about that cat litter! Yuck! Thank you so much for linking up to Merry Monday this week! I am sharing your post today on my Twitter! We hope to see you next week for another great party! Have a great week! I have so many of these right now because I’ve been sick for a week. It’s grossing me out. Sick of not, I’m taking care of hot spots today. Shirley I love this post. Oh some people do not know the difference between what is normal or not when it comes to cleanliness. I clean motel units and can tell how a person lives at home by the way they leave the rooms. Most are great but every now and then we get the food splattered around, unflushed toilets etc. Thanks for sharing on #wednesdayswisdom. I’m convinced some people think (falsely) that we see that kind of filth ‘all the time’. They are so wrong, thankfully!! I can only imagine the motel rooms when I know what rental properties look like! You are so right! I get so grossed out by the nasty things my family leaves around the house. I clean the kitchen sink every time I do the dishes. Mommy’s have so much to do, not the least of which is training their families to clean up behind themselves and help maintain the house as well! It’s quite a chore. Mother’s Day should come twice a year!! Eeek! Some of these things are just so gross I could not even finish reading them all! Yuck! You certainly sounded disgusted by this one! I just can’t imaging – that cat litter one! Great post Shirley! I didn’t even tell them all…You wouldn’t believe some of the filth we have seen through the years! The cat litter home created the F9 Filth Factor as being the worst. I cannot even imagine living like that myself, ugh! Okay I was a little scared to read this one (my house isn’t the cleanest, by any means!) but we don’t have nearly all of the problems on this list! If I could just get my husband to put his dirty dishes in the sink we’d be doing good… he tends to forget them and drive me crazy! That story about your husband reminded me of how my Mom used to wait on my Dad hand and foot. She would not only cook the meal but fix his plate and sit it before him, then remove it from the table also after the meal. Over the years he realized the situation and started tending to himself so she could sit down at the same time he did! My hubby frequently picks up my plate when dinner is done so I try to reciprocate often. I wish I could say that the dishes ALWAYS make it to the sink immediately but sometimes it make take a little while, the same day though. I agree with you about those dishes needing to be scraped and rinsed prior to going in the sink. It is a must!! I’ve seen some houses that would make someone with the strongest stomach roll. But, such is the life of a social worker. Thanks for sharing your tips with us at the #AnythingGoes Link Party. Sandy, I used to be a social worker. I know what you mean, not even wanting to sit down on the furniture! God bless you for your service as a social worker, a very self rewarding career. Ewwy, some of these are so gross. Who doesn’t use a real litter box — yuckkkk!!! I’m guilty of using a sponge to wash dishes though, usually just pots and pans but still! I definitely didn’t know those weird little plastic scrubbies can be put in the dishwasher though! Thanks for the tip! Alex, I’m sure you clean your sponge after each use. They tend to grow germs very quickly due to the length of time they stay wet and dirty. Soaking it in bleach will help. Sponges certainly have their place in the kitchen but they just need to be properly cleaned. When we had house keepers, I’d make my kids clean before they came. They never understood why I made them do this. Hahaha! the battle against flith is never done!! Love the sign for little and big boys when in the bathroom!! Thanks Ursula. I’ve seen some ladies rooms in need of that sign too! Thank you for all your tips! I get mad when my husband puts dishes in the sink and doesn’t rinse them out first – make my job so much harder! Wouldn’t it be great if husbands came already trained! I admit – the OCD in me was a little scared to read this! But you had great info – I was happy to feel that I “passed,” not committing any of the infractions 🙂 the cat litter story – ugh!!! In pretty sure I can’t un-see that vision in my head! Karen, I’ve never been able to un-see that vision and it has been many years ago. It’s amazing just how uninformed some folks are about what is considered nasty or filthy.